Parma Number 46: The Aspley Hotel … Not as advertised but still pretty good! The Verdict: There were some absolutely excellent elements to this dish that made it most enjoyable. I confess though that when I saw on the menu this Parma advertised as the “Monster Parmigiana” I did have expectations as to the size of this meal. Those expectations were not met though as this chicken parmigiana was pretty standard when compared with the 45 I have tested so far. Chicken: I really enjoyed the chicken piece with this parmigiana. It was well crumbed and had been perfectly cooked. It tasted great. Tomato Sauce: The absolute hero of this dish was the tomato sauce. It was plentiful and covered the chicken piece well. It complemented all of the other elements of the dish really well and was perfect from a taste perspective. Ham: I can not be critical of the ham on the Aspley Hotel chicken parmigiana from a taste perspective and I have to say I was pleased to see that the ham was not cubed or shredded! My only complaint about the ham on this dish was the fact that it did not cover the chicken piece. Cheese: My review of the cheese on this dish could almost be a cut and paste of my review of the ham. In short: it was great in all respects but for the fact that it did not cover the chicken piece fulsomely. Side Dishes: This is where my main criticisms about the Aspley Hotel’s chicken parmigiana arise. I am always concerned when I see a salad come out in its own bowl: to me that connotes that the salad has been pre-prepared and refrigerated. My concern was well founded here. The chips were just a bit bland for my liking as well as being a bit over cooked. Presentation: In this case a picture does tell the story. The chicken covered almost all of the chips = enough said. The Venue: The Aspley Hotel is in the northern suburbs of Brisbane on Gympie Road in Aspley. Tuesday night is poker night as we discovered as we walked through the main bar. The bistro is excellent and most meals we saw coming out were massive. My chicken parmigiana cost $21.90. The expectation that I had that it was going to be a “Monster” sized meal which it was not. The side dishes were quite ordinary to be honest which, coupled with the coverage issues the ham and cheese had, was quite disappointing. 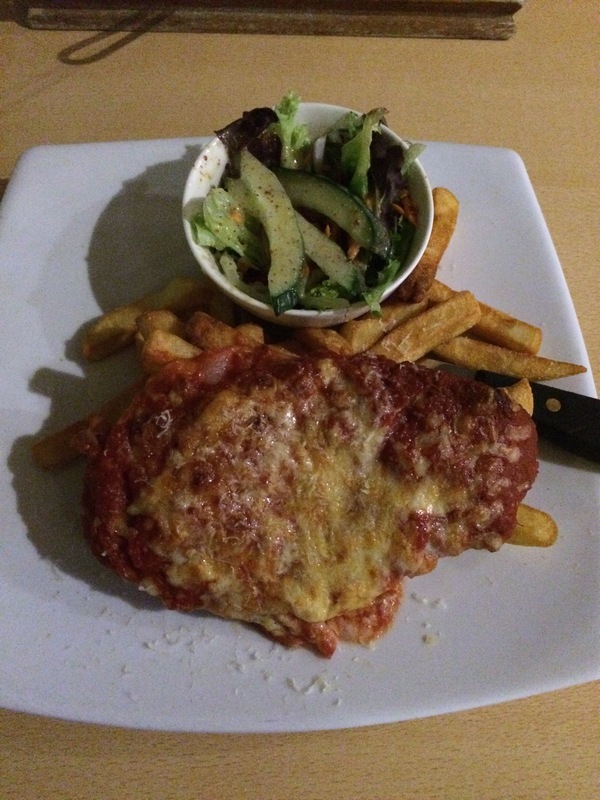 This entry was posted in Uncategorized and tagged Aspley Hotel, Brisbane, brisbane's best parma, chicken parmigiana, Parma. Bookmark the permalink. 3 Responses to Parma Number 46: The Aspley Hotel … Not as advertised but still pretty good! Maybe ‘Monster’ referred to the chef that cooked it!! I produce 612 ABC Brisbane breakfast radio. We would like to talk with you. Can you email me with your contact details? Hi Anne: what is the best email address to get you on?